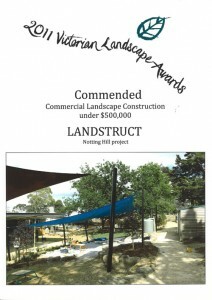 Landstruct Landscape Construction PL is recognised in the Landscaping Victoria 2011 Awards. 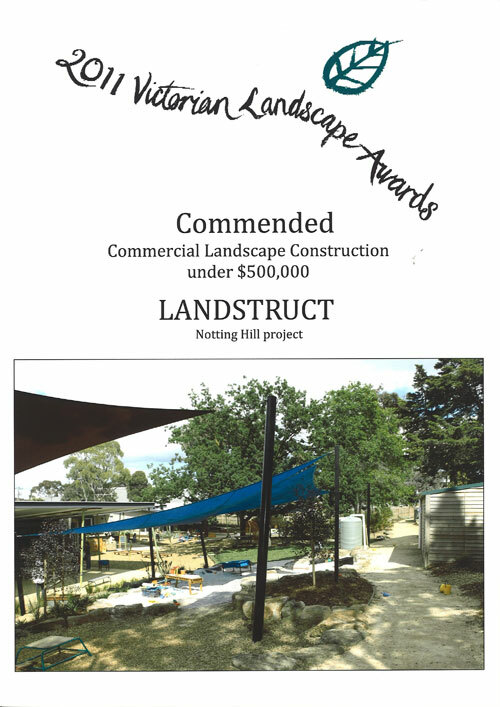 Landstruct is pleased to announce its commendation for the Monash University Childcare Centre project in the Landscaping Victoria 2011 awards held on Saturday 19th November at The Forum Theatre, Melbourne. Celebrating excellence in landscape design and construction, the awards are a well-respected event on the landscape industry calendar. The new Childcare Centre was designed by Perkins Architects on a greenfield site north of the main Clayton Campus. The Monash University Childcare Centre landscape involved major earthworks and drainage, concrete works, stone paving, rock embankments, sandpits, swales, bridges, water tanks, log placement, lawn, planting, mulching and irrigation. The centre was open for a period of the works – requiring careful site fencing and attention to detail with clients during operations. “The project provided us with a challenge as the site came with some significant drainage issues and a tight timeframe as it was due to open at the start of the university year and the builders were running behind. We had an opportunity to be creative with rock selection and placement, tree log selection and random paving layout.” said Cameron Grant, Director Landstruct. The Landstruct team is knowledgeable, experienced and enthusiastic with specialist skills in all aspects of landscape and related civil construction. We understand the complexities and safety issues around school and childcare projects and are committed to excellence and sustainability in the building environment.